DRDO's Aerial Delivery Research and Development Establishment (ADRDE) at Agra is developing a Heavy Drop System to airdrop BMP class ICVs from IL-76 aircraft. Heavy Drop Systems are used by the Indian Armed Forces to quickly deploy heavy combat payloads at relatively inaccessible areas. Three types of heavy drop systems are currently in use by Indian Armed Forces. ADRDE earlier developed HDS (P-7) under an import substitution project sanctioned by DRDO HQs in 2004, as the initial lot of HDS P-7 procured from abroad were nearing their designed lives. HDS P-7s have been inducted into the AFs after user trials. Because of limited availability of IL-76 aircraft, in May 2014, ADRDE released a RFI for developing a Aircraft Fitment Simulator for IL-76 aircraft. The simulator would be a replica of cargo floor of IL-76 aircraft to enable loading and fitment of platform. The elevated fixture will comprise conveyor rollers, monorail, with loading and extraction system identical to the actual aircraft. This fixture will not only help in quantitative analysis of critical gaps, but it will also help in providing opportunity to carryout loading/unloading exercise of the system. Any heavy drop system comprises of two sub-systems: Platform and Parachute. The two systems along with the military store to be dropped are termed as "Load" in Heavy Drop Systems terminology. Platform System provides palletization of military store on a suitably designed Pallet. It consists of a number of Devices and Accessories required for lashing of store with the Pallet, locking of Pallet with the aircraft, safe ejection of Pallet from aircraft, damage free ground touch down, automatic disconnection of parachutes at touch down, quick unlashing of store from Pallet etc. 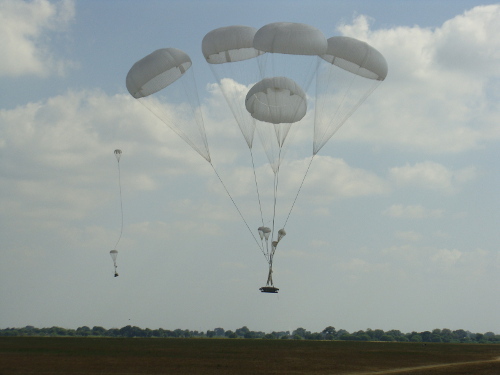 Parachute System comprises of a number of parachutes with associated metallic components required for flawless sequential deployment of these parachutes. This system ensures safe extraction of Load out of the aircraft, stabilization of Load, reduction in descent speed etc. The Load is placed inside the cargo compartment of the aircraft and secured with cargo floor using certain devices. At desired location of the paradrop, the Load is extracted from flying aircraft from its tail side with help of extraction parachutes, which are operated by the Aircrew. The platform moves within aircraft on a set of Roller assembly fitted on the cargo floor and its movement is guided with help of a monorail fixed longitudinally at the center of cargo floor. There are two sets of Guide Blocks fitted at forward and rare sides of the Platform, which act as mating part of the monorail of the A/C.